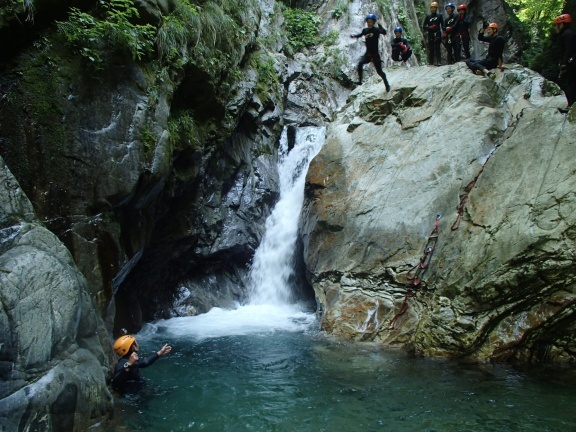 Canyoning – very popular in Europe, not very known in Japan. 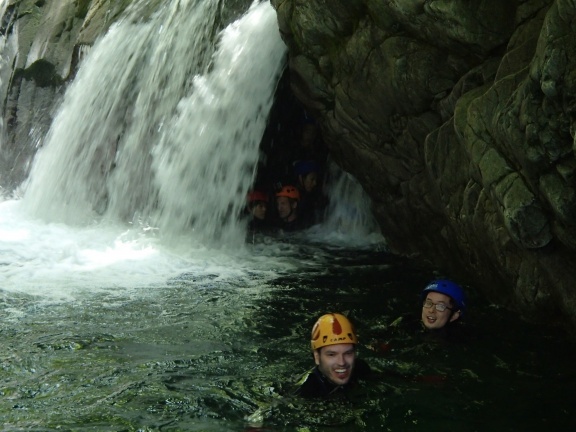 While I have been climbing up rivers quite some time (see these blog entries), last weekend I had the first time the chance to do something resembling canyoning. 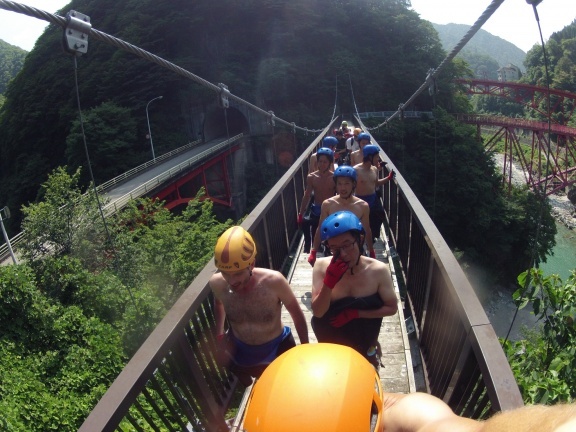 The big difference is the main direction: During Sawanobori we mainly climb up, while during Canyoning we mainly go down. After long searching of a suitable wet suit for myself (Japanese sizes, you guess! ), distribution of harness, helmets and the like, we were carried to the entrance of the river, from where we had to walk over a nice bridge and a bit up the river to the start of the experience. We must have made a very silly impression walking over that bridge with black wet suits, sweating like hell. After about 30min of walking and easy climbing up the river (huuu, that was Sawanobori! Only with wet suit, so much hotter!) we arrived at a nice waterfall and big swimming pool, which we (ab)used for some easy playing around. Swimming with wet suit is so simple, you just float around. In the upper parts a few times we had to cross so called white water, fast running water. No long swim, though, easy enough even for beginners. Still, a helping hand was always near by. In our group of 9 clients and 3 guides everyone was fit and sportive, so no problem for anyone. Having my GoPro camera with me I fixed it to my helmet and jumped down taking a video of it. Quite scary … I remember doing 15m jumps during some canyoning courses for mountain guides, but that is some years ago. 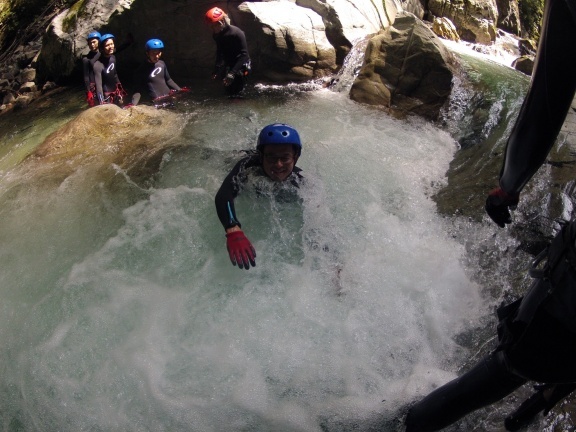 Another of the pleasures of canyoning are slides: Sliding down in the water like on a sledge. Though I had quite some slides back in Europe, this time we did something new: back side head first sliding of a cliff and a 2m step into a deep pool. 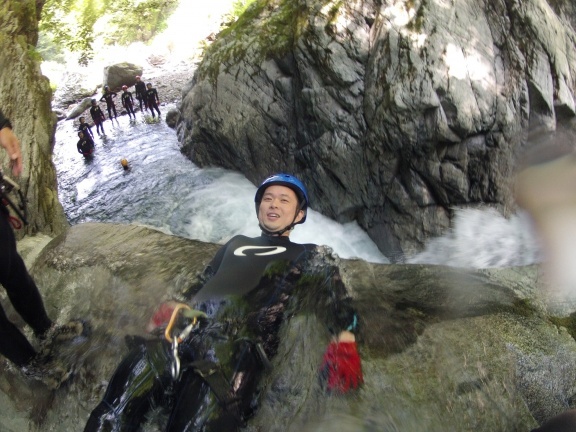 My friend from Toyama, his first time in a river, generally not the adventurous type, just starting of into the slide. I was impressed how relaxed he looked! After all these challenges and a few more meters down to the entrance we cooled (and calmed) down a last bit before returning to the J-WET office, all happy and content. A very nice day, thanks to everyone. I can recommend the team of J-WET fully. Very professional, long years of experience, and keeping a relaxed and friendly atmosphere all the time. 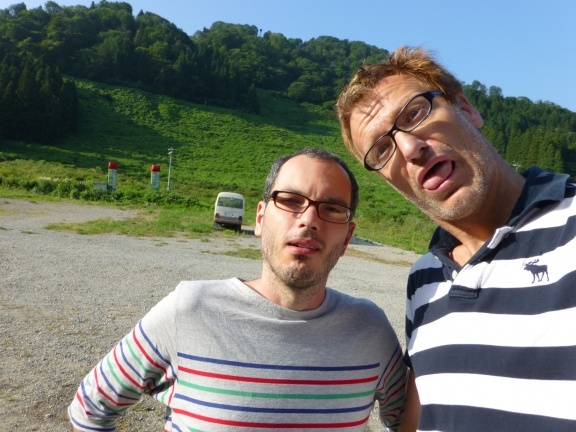 Please come and enjoy the pleasures of Kurobe and Japan with J-WET. 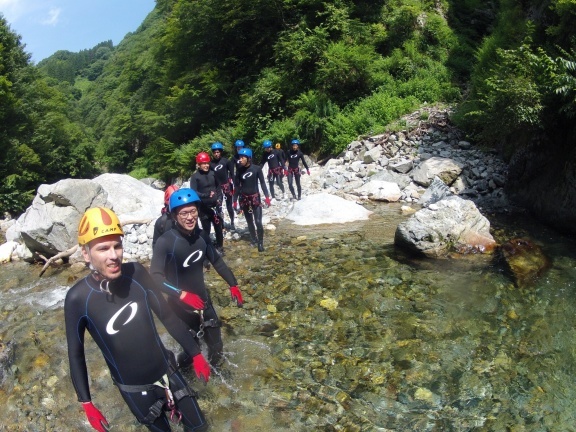 More photos can be found at the gallery Canyoning Kurobe August 2013, and points of interest are marked in the Google map below.